Disposable email services are great for a number of purposes on the Internet. Probably the core use is for registration purposes on the Internet. Some sites block access to the services or contents they offer to guests, effectively forcing users to register to access the contents. While it may sometimes be possible to use a service like Bug Me Not for that purpose, you more often than not come up empty and need to register. You may have your reasons for not revealing one of your own email addresses, from the fear of it being sold off by the site operators to being flooded with spam or being associated with the site. That's where temporary email addresses come into play. Here are some tips to make the most out of those email services. While it is often enough to know one temporary email service, you will notice that a lot of websites block certain popular choices, forcing you to use a different provider. I suggest you check out our list of 20 temporary email services as a starting point. You can alternative run a search for those email services to find additional services that are not listed on that page yet. You will eventually come upon sites that have banned several of the popular temporary email services, maybe even most of them. This can be a frustrating experience if you need to access the site's contents at that very moment. What most site operators have not done however is ban the alternate domains that some providers ship with. 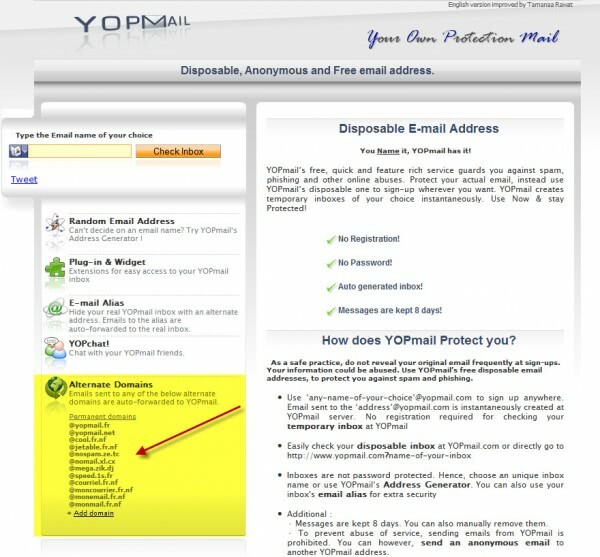 If you visit the Yopmail website for instance, you will notice a list of ten alternative domains that you can use instead of @yopmail.com. Usernames share the same mailbox, which means that you can use example@yopmail.com, example@speed.1s.fr or example@cool.fr.nf to register an account on the Internet. Tempinbox is also making available additional domains for you to use. Add-ons like Bloody Vikings for the Firefox web browser support one or multiple disposable email services. 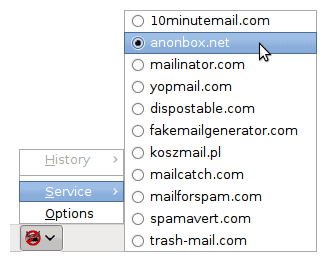 The Firefox add-on for instance supports more than ten different disposable email services. It furthermore optimizes the registration process by automatically opening the selected service in a background tab so that you can check the verification email right away there. Another feature that browser extensions may provide you with are a history feature to access previously registered email addresses again. I personally prefer temporary email services that let you delete emails once you have read them. The reason behind this is simple: other users of the service who happen to enter the same username will see all previous messages, up to the point when they are deleted by the provider. It is then possible for them to access the account by requesting a new password, which conveniently will arrive in the mailbox they are currently accessing , giving them full control over the account. If you delete your messages afterwards, you improve the account safety significantly. I would not suggest to use personally identifiable information on the sites you register accounts with, but if you do, you should make sure to hide the email address from public view on the site, to block notifications from being send to the email, and to delete emails whenever you have accessed them. Instead of using a temporary email service, you can alternative create a new email address at a service that lets you do that without phone verification. While some providers like Gmail force you to verify the account before you can use it, others like Yahoo Mail or Hotmail do not. While you will spend more time setting the email address up, you can be sure that you are the only one with access to it. Another benefit of this approach is that it is less likely that free email providers like Hotmail or Yahoo Mail are blocked by websites. Disposable email services are excellent when it comes to forced registrations on the Internet. Feel free to post your tips in the comments. Personally, I use GuerillaMail “…lets you generate a temporary email which expires in a time of 15 minutes and also tell you how to offer a temporary email service on your site.” It is usually not blocked as they use the sharklaser domain. For temporary addresses I use ’10 minute mail’ via the Hello World extension for Opera. For longer lasting accounts with anti spam benefits, I’ve used the email forwarders http://www.spamgourmet.com and http://www.mailnull.com for many years. I use trashmail.net. They offer a Firefox extension as well as a Plus service with costs. The disposable email list you link to at the top of this article is from 2007. It is way out of date. Spamex is not mentioned at all (which is the service I use but is not free). I used Spammotel for years before Spamex and suddenly it stopped working. It looks like it might still be working now but I haven’t seen a spammotel email addr in years. Maybe it is time for a new updated list? yes! I suggest mmmmail as a new entry. And several other ones are worth to mention. An updated list would be something I would definitely bookmark. …and if any alias starts getting flooded with spam I can just set rules up to direct inbound messages from that alias straight to trash without affecting inbound messages from any other aliases. The service you describe is NOT a free service. Thanks a lot for the great post on How to use disposable email services like a Pro. This is very helpful for a newbie like me. Thanks for the tips. I personally use a Yahoo email address when I register on sites, blogs etc.